Citation Information: J Clin Invest. 2007;117(4):931-943. https://doi.org/10.1172/JCI29031. Autism, characterized by profound impairment in social interactions and communicative skills, is the most common neurodevelopmental disorder, and its underlying molecular mechanisms remain unknown. 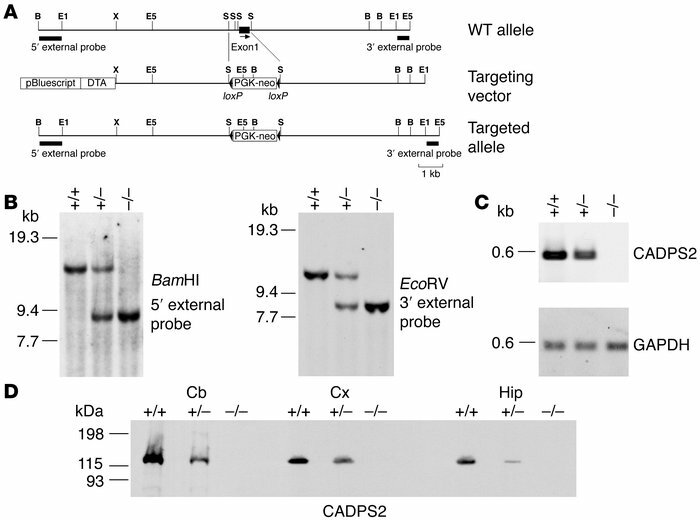 Ca2+-dependent activator protein for secretion 2 (CADPS2; also known as CAPS2) mediates the exocytosis of dense-core vesicles, and the human CADPS2 is located within the autism susceptibility locus 1 on chromosome 7q. Here we show that Cadps2-knockout mice not only have impaired brain-derived neurotrophic factor release but also show autistic-like cellular and behavioral phenotypes. Moreover, we found an aberrant alternatively spliced CADPS2 mRNA that lacks exon 3 in some autistic patients. Exon 3 was shown to encode the dynactin 1–binding domain and affect axonal CADPS2 protein distribution. Our results suggest that a disturbance in CADPS2-mediated neurotrophin release contributes to autism susceptibility. (A) Maps of the Cadps2 gene, the targeting vector, and the resultant targeted allele are shown. Probes for Southern blot analysis to screen for targeted ES clones are indicated by small solid bars. Restriction enzyme sites include the following: B, BamHI; E1, EcoRI; E5, EcoRV; S, SmaI; X, XhoI. DTA, diphtheria toxin A fragment (B) Southern blot analysis, using the probes indicated in A, of DNA from tails of a single litter derived from a cross between heterozygotes. +/+, WT mice; +/–, heterozygous mice; –/–, homozygous mice. (C) RT-PCR banding patterns of CADPS2 using brain total RNA of P21 WT, heterozygous, and homozygous mice. The GAPDH gene was used as a constantly expressed control mRNA. (D) Immunoblot analysis of the cerebellum, neocortex, and hippocampus of P8 WT, heterozygous, and homozygous mice. Protein lysates from these brain regions were immunoblotted with anti-CADPS2 antibody. Cb, cerebellum; Cx, neocortex; Hip, hippocampus.